Fair warning- this is a long and picture heavy post! This dress had been a long time on my wish list. 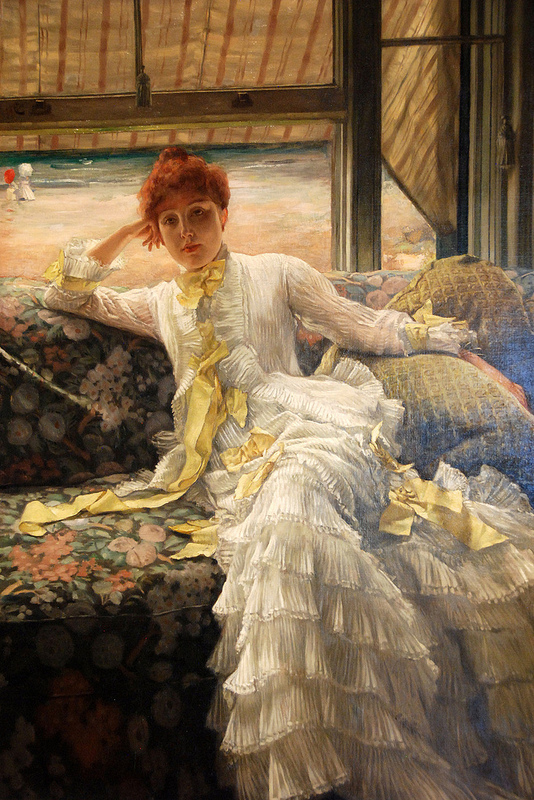 I’m an ardent fan of James Jacques Tissot’s paintings, and a particular dress that appeared in a few variations in several of his paintings really inspired me. The dress is not an exact copy, but is inspired by the following paintings. Portrait of Miss Lloyd (on left) from loveisspeed. July (on Right) posted by a friend online. July: Specimen of a Portrait from Flickr (on left), Fete Day at Brighton from Wikimedia Commons (on right) has different color bows but is the same dress. I started this dress in June of last year and actually did wear it to Costume College last year, but only for an hour or two, during which I taught a class. After Costume College last year I finished it up and meant to take pictures the entire year, but after a bit of thought decided I liked it too much to not wear again, so it made another (longer) appearance this year. The photos below combination of photos taken at Costume College this year and afterward at a public park. The skirt was made from the Truly Victorian natural form Fantail Skirt pattern. I wanted this to be a transitional dress between early bustle and natural form, so I actually tied the back of the skirt looser (it’s on a drawstring) and fit it over my Truly Victorian Petticoat with Wire Bustle, and tied the tapes inside the bustle somewhat loosely to have a smaller bustle shape. The “polonaise” was made using the basis of Truly Victorian bodice shapes and I compared the cut with several in Francis Grimble’s Fashions of a Gilded Age (I don’t remember if it was book 1 or 2). Since I am already familiar with the cut of Truly Victorian bodices I found this to be easier than scaling up and fitting a bodice from an original pattern I wasn’t familiar with. The skirt and polonaise are both accented by pleating that is edged in lace. The front fastens up the center front with hook and eye tape, and the bows are taffeta cut into bias strips and then tacked on. The dress is made from a cotton/poly blend. I was told it was all cotton when I purchased it in the Garment District in LA, but boy- was pleating it a pain! I used the Perfect Pleater, but since it had poly in it, it did not want to hold the pleats. In the end I used a combination of vinegar/water to set the pleats- sprayed it heavily and ironed the pleats in until they were well dry. I waited for it to cool. I then did a heavy coating of spray starch, gave it a second to set, then ironed it well (too soon after spraying and it would stick! ), and then waited for that to cool. Part way though this project I realized how beneficial a press cloth can be! Yes, it took FOREVER and is not something I’d like to repeat soon. I’m actually unsure of the yardage. I just kept going until I ran out of fabric! I’d still like to make the matching jacket but I ran out of fabric. I just saw it again on the last trip to LA, but forgot why I wanted it. Of course, now I remember! I hope they still have it whenever I go back- I went on a wild goose chase last year trying to find the darn fabric again with no luck! At the last minute before Saturday at Costume College I remembered I didn’t have a hat so threw one together very quickly with fabric scraps and hot glue on a straw base bought from Truly Victorian when they sold these. My husband painted it white for me last summer. I just posted my favorites here (and I know there’s a lot) but I have several more photos of this dress on Flickr which aren’t in this post. You can see them here. Wow, I’m not a fan of the bustle era, but this is sensational, Lauren! Gobsmacked by this gorgeous cupcake of a dress! Kudos, lady! OMG!! The dress is gorgeous! You look beautiful! You did an amazing job! I love the natural form era! Beautiful! Breathtakingly beautiful. I think your time spend on the pleats was well worth it for a dress that lovely. You look stunning in it. Much like the paintings you reference. MUCH prettier on you than in all the paintings but the first one! You make it look elegant & shapely – most of the paintings make it look hangy & draggly! BEAUTIFUL work! I love this, a truely magnificent gown and you look wonderful in it! It really captures those fabulous paintings, well done! How absolutely lovely!! You look like you popped right out of the painting! I too am embarking on a Tissot Dress, the pink dress from Too Early. Some day all us Tissot girls will have to meet up and have a big party! ab-so-freaking fantastic! I cannot imagine what your closet looks like, it must be amazing. Another very very stunning dress… Wow. I kind of want to make the blue one, myself, but I’d never have a chance to wear it! Just, wow! You are an incredibly talented lady. Absolutely gorgeous. I love how the light can almost subtly change the colour of the dress from clear white to a hint of blue and the ribbons from a delicate yellow to a peach. It really suits you so well and there is this lovely cool, and ethereal feel about the dress and yourself. Wish I could wear white, but I’m just too pale so its lovely to see others who can wear it so beautifully and elegantly. Wish I could have seen it in person – perhaps I will one day. Wow it is truly amazing and I cannot find any words to describe it beyond that. Wow! Is that a lovely dress or what! You put so much work into it! This is probably the most romatic gown I have ever seen! Oh. my. goodness. I honestly think this is the most beautiful reproduction garment I have EVER seen!!! Congratulations! Wow! You are extremely talanted and patient and you deserve some sort of Nobel prize for that dress. I would give anything to wear something like it for just five minutes. It is feminity personified. I can’t believe you were brave enought to walk through the dirt with it on……..yikes! It belongs in a museum!